The control tower at RAF Metfield, on 30 May 1944, AAF personnel waiting for returning aircraft. Royal Air Force Metfield or more simply RAF Metfield is a former Royal Air Force station located just to the southeast of the village of Metfield, Suffolk, England. Metfield was built as a standard, Class-A bomber design airfield, consisting of three intersecting concrete runways, fifty dispersal points and two T-2 type hangars. Additional buildings were also erected to house about 2,900 personnel on former farmland to the southwest. When it was constructed in 1943, it necessitated the closure of the B1123 road between Halesworth and Harleston. The airfield was built for the United States Army Air Forces (USAAF) Eighth Air Force as a heavy bomber field. During the Second World War it was known as USAAF Station 366. 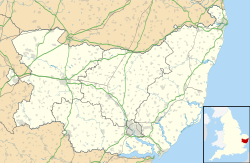 Metfield was one of the most isolated Eighth Air Force stations in Suffolk. The first American occupants of Metfield was the 353rd Fighter Group, moving in from RAF Goxhill on 3 August 1943. The 353rd was assigned to the 66th Fighter Wing, at Sawston Hall, Cambridge. Group markings were black, yellow, black, yellow spinners, with a 48-inch black and yellow check band around the cowling to the end of the exhaust stubs. On 12 April 1944 the 353rd moved to RAF Raydon. With the departure of the P-47's of the 353d, a B-24 Liberators bombardment group, the 491st Bombardment Group (Heavy) moved in. The 491st starting arriving on 15 May and the last aircraft arrived on 30 May 1944. The squadrons were unusual in it having its ground complement recruited from other stations of the 2nd Air Division. The group commenced operations on 2 June 1944. The 491st attacked airfields, bridges, and coastal defenses both preceding and during the invasion of Normandy. After D-Day, the unit concentrated its attacks on strategic objectives in Germany, striking communications centers, oil refineries, storage depots, industrial areas, shipyards, and other targets in such places as Berlin, Hamburg, Kassel, Cologne, Gelsenkirchen, Bielefeld, Hannover, and Magdeburg. On one occasion the 491st attacked the headquarters of the German General Staff at Zossen, Germany. On 15 July 1944 at 7:30pm the bomb dump at Metfield exploded. One bomb mysteriously detonated, practically setting off the entire munitions storage area. 1,200 tons of high-explosive and indendinary bombs rocked the countryside for miles around. Five men were killed and 5 B-24's in nearby hardstands were severely damaged beyond repair. An additional six aircraft were severely damaged. There is an eye witness account of being blown flat 3.5 miles away from the explosion. After the explosion, an extended loop road was built to by-pass the crater left by the explosion. The crater subsequently became a dump for all manner of discarded items. On 15 August 1944, the 95th Combat wing was broken up and the 491st was moved to RAF North Pickenham. After the 491st moved, a small number of B-24's were still assigned to Metfield, under the command of the European Division of Air Transport, United States Strategic Air Forces in Europe (USSTAF). These aircraft were used by the 1409th Army Air Force Base Unit, a classified unit engaged in clandestine transport operations to Sweden, flying out special materials and ferrying personnel. The 1409th operated from Metfield until the end of the war operating the B-24s, as well as C-47s and C-54s. The unit also used RAF Leuchars in Scotland as an advanced base. On 4 March 1945 during "Operation Gisela" RAF Metfield was strafed by a Ju 88(G-6) of the Luftwaffe, killing one man in the control tower. The aircraft crashed just south of the airfield, after attempting to attack an inbound B24, with its upward firing cannon. In May 1945, RAF Metfield was closed and returned to the RAF. It was subsequently abandoned, but remained in the hands of the Air Ministry. Metfield was not used by the Air Ministry after the Second World War ended and for years it sat abandoned and empty. In 1964 and 1965, the airfield and support buildings were sold to private individuals. Metfield was returned to agricultural use; however, the site of the bomb dump explosion could be seen for many years as a water-filled lake. When the lake was cleaned out, all types of discarded equipment was found, including several unexploded bombs. Indeed, ordnance that was tossed into the air during the bomb dump explosion has been found over the years in the fields surrounding Metfield. Pieces of metal from the exploded bombs has been found scattered over the area to the present day. In the late 1960s the main runways, taxiways and parking aprons were mostly torn up or turned into single lane agricultural roads. Sadly very little evidence of the airfield can be seen today only a few brick buildings, deteriorating Quonset (Nissen) huts, and some concrete roadways that were aircraft taxiways. Wikimedia Commons has media related to RAF Metfield.